The Manly Ferry Has Docked. 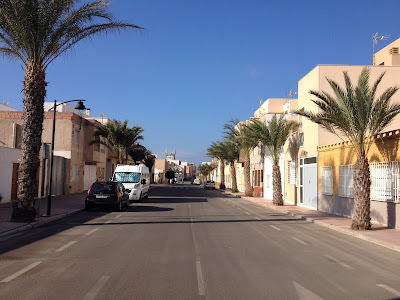 It transpired that while navigating their way back from the mountains near Granada, Southern Spain, Bombo and Sammie spotted the road sign to Cabo de Gata and remembered that we were usually here at this time of year as we visited them in Mojacar last year. They decided on a brief diversion for a couple of nights here just to say hello again. Our paths first crossed by email after reading their plans to take up narrow boating in the UK while we were aboard MV Oriana docked in their then home city of Sydney. They were busy packing up for the journey to the UK, and we were only in Sydney for a very short visit as a port call during our 2012 world cruise. Consequently we couldn't meet on that occasion. Now the Manly Ferry has docked for a short port call here. Paul and El write their own travel blog here: Narrowboat (now motorhome) The Manly Ferry. Yesterday we had decided to have lunch out at one of the restaurants in Retamar before travelling down to Almeria to make our weekly visit to the Mercadona Supermercado for the 'big shop'. (You can get your 'bits' locally at the small village of Ruescas just a mile away). When we arrived home the Manly Ferry, another Rapido just like ours but built on a Mercedes chassis, was already docked and connected to shore power. Last night we returned the favour, and patronised the newly re-opened site bar where free beer was on tap all afternoon last Saturday to mark the occasion. 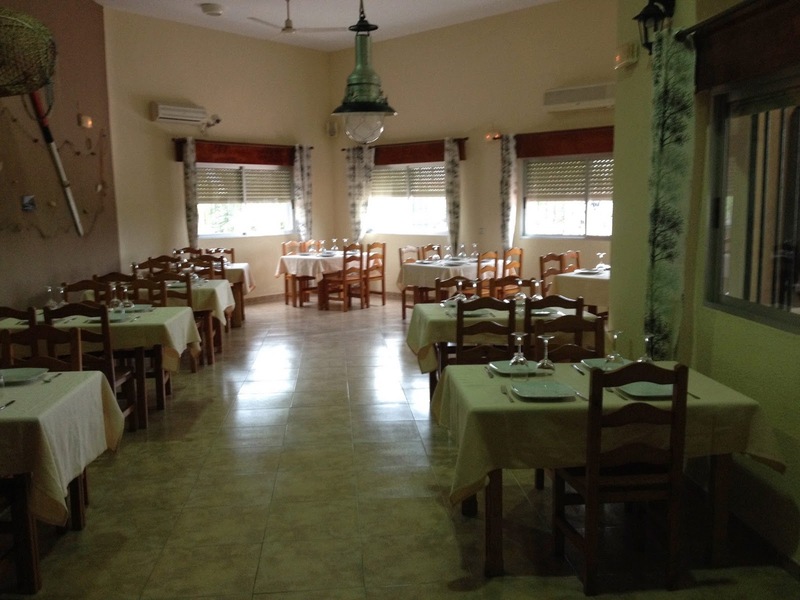 The bar and restaurant have been completely refurbished. We are looking forward to the next couple of days. 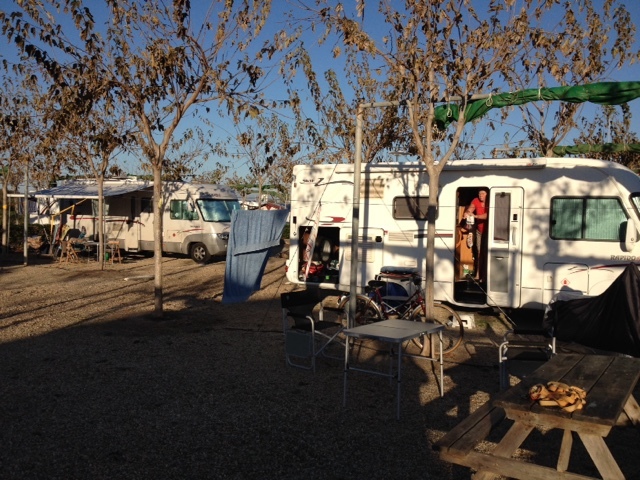 For the reader who is a motorhome owner, or a potential motorhome owner, and has an interest in what might be the outcome if something happened while travelling abroad which would need the assistance of your insurer or your roadside recovery contractor - read on. 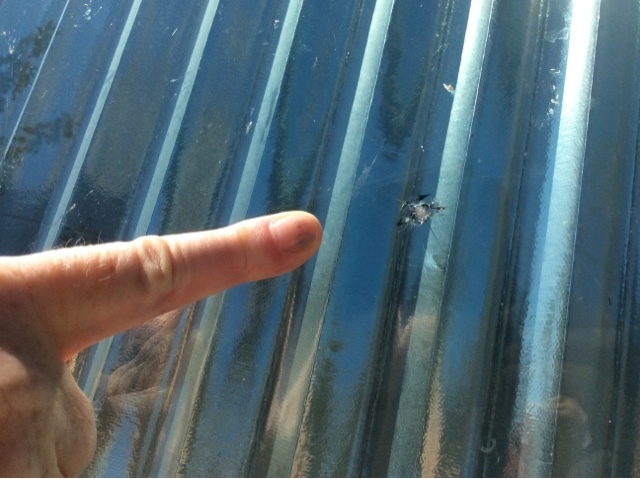 I have previously reported that we gathered a small, fairly insignificant chip to the passenger side of the windscreen on the last day of our journey down to the South of Spain. As these things can expand across the screen, making replacement a necessity, I decided I might try and get it repaired sooner rather than later. Although living with it temporarily is no big deal. To my surprise (not really I suppose), I found my insurer and their roadside assistance contractor to be a bit of a waste of time. I had difficulty getting them to answer the phone, and when they did, after offering incorrect telephone numbers to an approved repairer that did not exist, they appeared to wash their hands of my little problem, leaving us to our own devices. 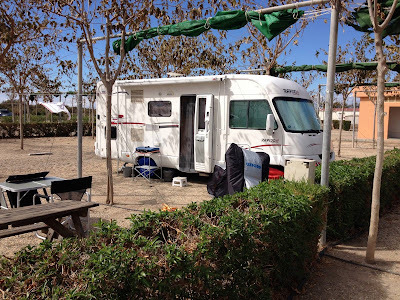 That is until I wrote an email to their CEO, outlining what I perceived as very poor customer service, together with the link to my reports about our situation here on my blog, which I write now as a motorhome and general travel site. At the start of business the very next day I had a telephone call from their customer services, the first, in response to our plight. Previously all emails had remained unanswered, and all phone calls had been initiated by me, with no satisfactory resolution. It was admitted that I had previously been given the wrong information, and our case had been assigned to this particular advisor so that a resolution could now be made to our satisfaction. I was happy with what they offered, as I could now go forward and try and arrange my own repair, although their service still didn't go as far as actually arranging a funded repair on my behalf - I would have to find my own repair company and pay any costs, then reclaim them once back in the UK. This has now been agreed as their "final response", a process that should be undertaken before any further complaints can be made to higher authorities, such as the Financial Ombudsman. Companies have an 8 week timescale in which to reach their final response, which hopefully should be agreeable to both parties. As the company was now agreeing to fund anything that might be required to fix our screen while in Spain, I was in agreement. What I hadn't bargained for was the difficulty I would then endure in having a Spanish glass repair company actually undertake the job! 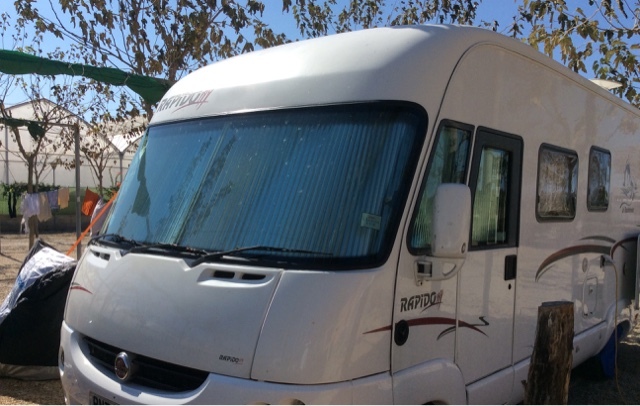 Ours is an A class motorhome, which means the glass is bespoke to the company that manufactured the motorhome, in our case Rapido, not the base vehicle which again in our case, is Fiat. Had it been a Fiat screen there would be no issue. However, as it is a Rapido screen, I can't find a company who is interested in the work. Because they don't want to get involved in replacing the screen should it break completely during a repair, then they won't undertake a repair either. A very surreal situation. I have now contacted all the companies in this area who advertise themselves as auto glass repair specialists, and none are interested. A large national Spanish company haven't even replied to my email request for an appointment or an email to their own customer services. There is one multi-national company operating here, who's parent company is in the UK, so I contacted them in the UK after their Spanish counterpart had also declined to do the work. The story was the same - if I wanted a repair or replacement in the UK they would be happy to do the job for me, but NOT here in Spain. They would not tell me why - just "we can't help you in Spain". This should be noted by drivers of A class motorhomes who would like to tour in this area. The job of replacing a windscreen seems to be firmly placed in the "too hard to do" drawer by the glass repair companies. I suspect that a specialist repairer of motorhomes would have to be located to undertake the work, and that is currently in my own "too hard to do drawer". Bacon Butties, The Weekly Wash And A Walk To The Beach. 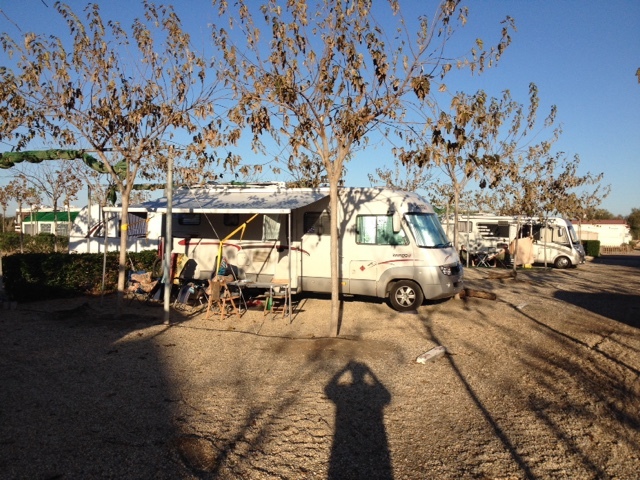 Well, it is Sunday morning again, our third week here in Spain. As is usual on a Sunday, we treat ourselves to bacon butties, (bacon brought in frozen from the UK), but here they can be cooked outside in the sunshine on the griddle. Margaret had placed a load of washing on using the Miele automatic washer which is just a short walk away in the amenities block. The timer stated 50 minutes to complete, just enough time to have breakfast while it does the work. Once completed, and washing hung to dry, I was taken for my daily dose of exercise from the site, into the "desert" to the beach. Today was the first time we have seen anybody else at the beach, as it is very secluded. Apparently there is a track which can be used to cycle from Cabo de Gata to Retamar, 7km away. 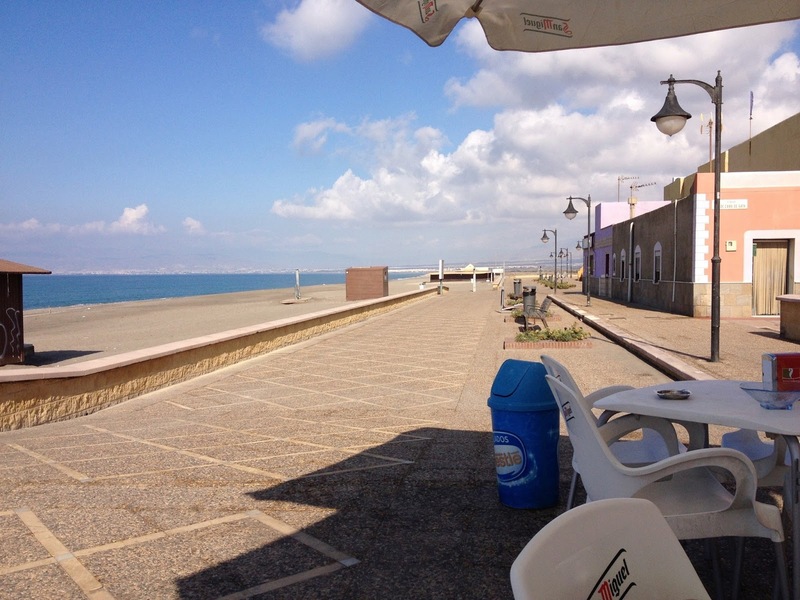 This section of beach has no track and has to be walked, past the salinas which is currently home to pink flamingos. In 2005, this area was chosen to host the Mediterranean Games, and Retamar, close by was built and developed to house the competitors. 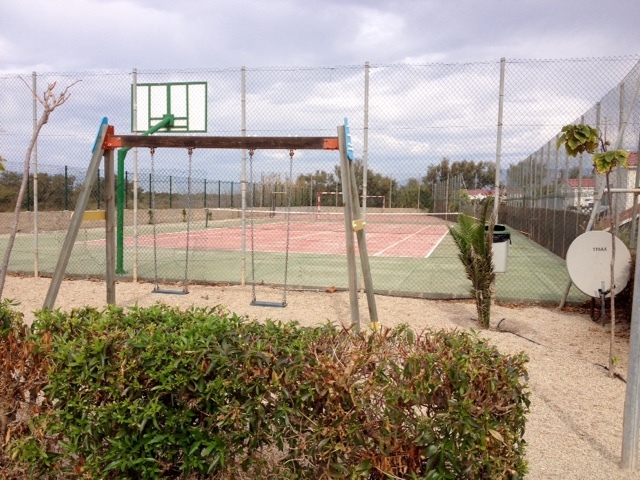 Now the apartments are holiday homes, and the sports facilities are left for public use. Before 2005 there were just a few rural fincas such as this, which have all been left to rack and ruin. Pink Flamingos wading in the salt lagoon. A lone cyclist walks his bike across the beach to the next section of track that will take him to Retamar. This is a short circular walk of around two miles, and is best done early morning or late afternoon due to temperature. Today, at 10.30am that was well above mid-twenties. 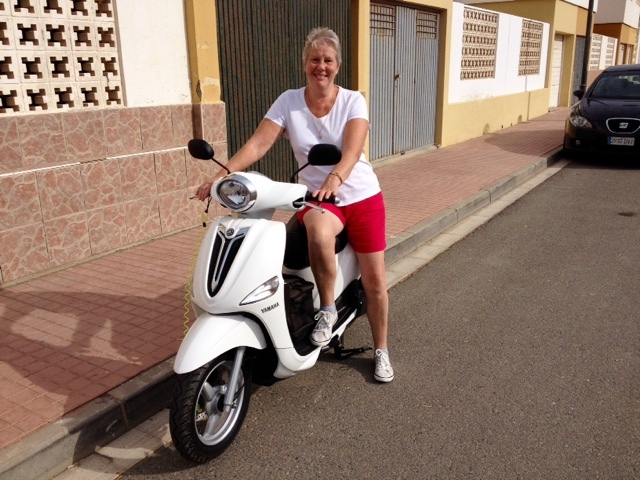 I may take the scooter to San Jose later today, but Margaret doesn't fancy a journey of that distance, around 20 miles there, riding pillion. 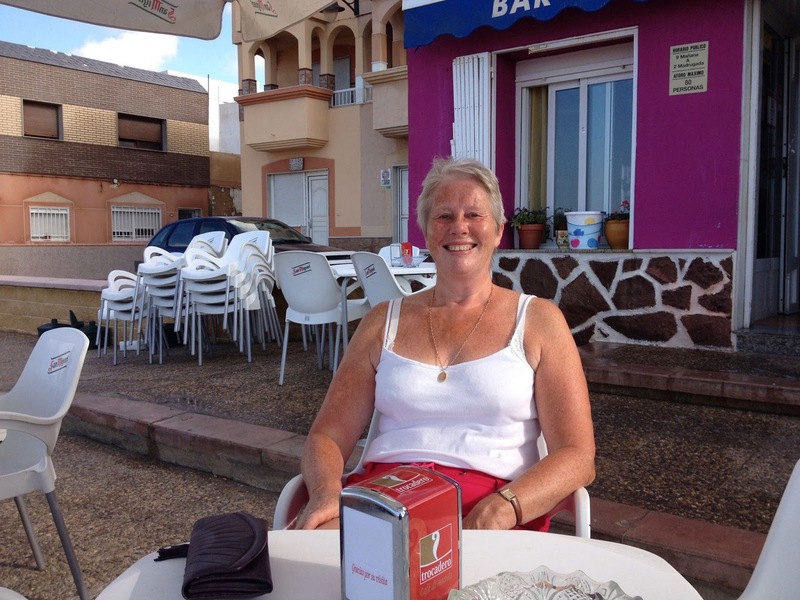 She says she still suffers from "numb bum syndrome", something I am obviously immune to having ridden motorbikes for many years since I was just 16. Just another lazy day here in Southern Spain. 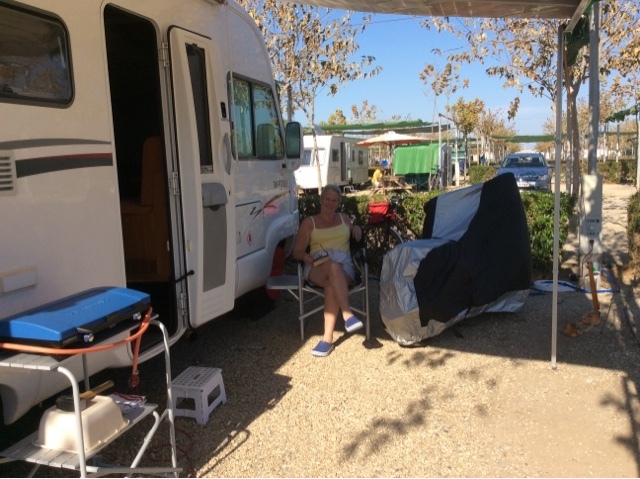 For those who have an interest in motorhome ownership, and thus how their insurance companies perform when a problem is encountered, here is an update into our own little current issue, a windscreen that sustained minor stone chip damage on the very last day of our journey down to the South of Spain. 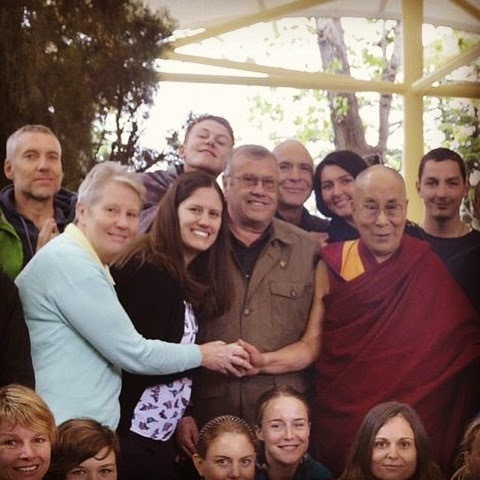 For those who missed my original report [Link] here is a brief recap of events. The day after our arrival I rang the breakdown / recovery contractor for the Premium European cover I have attached to my Saga fully comprehensive motorhome policy. No joy there as I had arrived safely at my destination. A further 4 hours or so on the phone, waiting for calls to be answered etc. I had got absolutely nowhere. Saga's auto glass contractor in the UK could do no more than tell me to sort myself out with a repair. Two emails of complaint to Saga Customer relations and two weeks later, I am still waiting for my first reply! So, today I rang customer relations and explained my problem again - in easy to understand SPOKEN WORDS this time. To which I was again given the two phone numbers for Saga's authorised glass repairer in Spain - Guardian Express, that were given to me two weeks ago. They were incorrect numbers the first time around, and they remain the same today. They are connected to fax machines! I can't find any contact details for this organisation on the internet either. Rather than do the ringing myself, this time I got the Saga customer services representative to do it for me so she could see this was a futile exercise. Getting nowhere fast again, she placed me on hold to ask her manager for advice. After a few minutes this was returned as " Get the repair or replacement done yourself, and Saga would reimburse once I was back in the UK. However if a new screen is required, then I would have to pay a £75 excess (I knew that already), and Saga would fund a new screen up to £100". What? a new screen for this vehicle is in excess of £1000 for the part alone! On querying this information I was told the low potential payment to fund a new screen was due to me having the repair done at a non-Saga approved glass repairer. If you wind this story back two episodes and two weeks, you will see that the reason I have to go to a non-approved Saga glass repairer is because Saga are unable to provide me with an approved repair or give me valid contact details for one here in Spain, so I could arrange a fully insurance funded repair myself. I have to ask myself why I am paying them an insurance premium? Although I know many of you will tell me it is to provide Saga's shareholders with a profit! During the last week we haven't really done much to report on. Life here continues at it's snail's pace, and we just tag along. 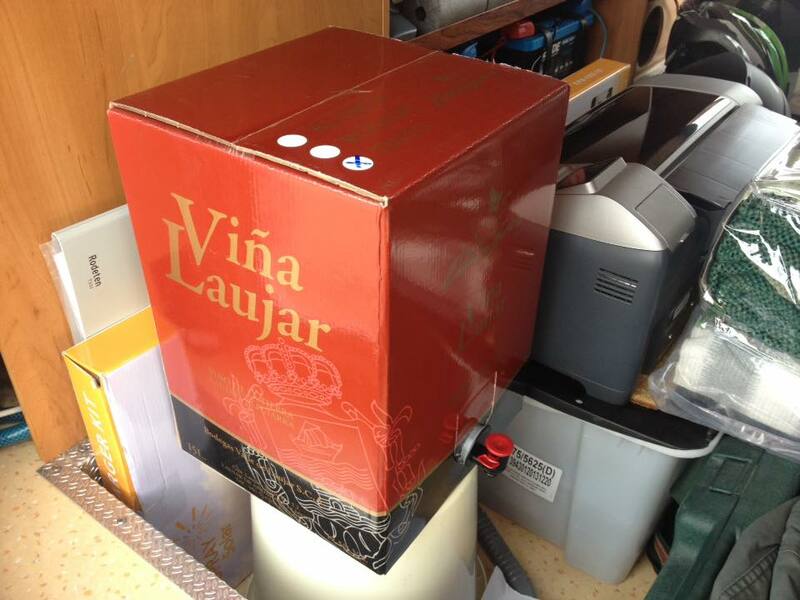 We have obtained a 15 litre box of red wine (22 Euros), and cases of beer which we store in the "garage" - very handy for topping up from during our evenings spent chatting outdoors. Great value at just 22 Euros for 15 litres! Our pitch here in Spain. The weather here continues to prove our choice of destination for the Winter was correct. Much of the continent has been suffering from the remnants of that transatlantic hurricane which has brought with it wind and heavy rain. However, as usual, all we have seen is a short burst of overnight rain the other night. The days continue to be hot and sunny. The little Yamaha D'elight is proving invaluable to us for getting about on, and it certainly is a delight to me to be able to ride on quiet roads in the warm sunshine. I do believe Margaret is also getting used to it as she allowed me to reach the 70kmh speed limit the other day as we took the main road into Almeria to undertake our "big shop" at the Mercadona supermarket. 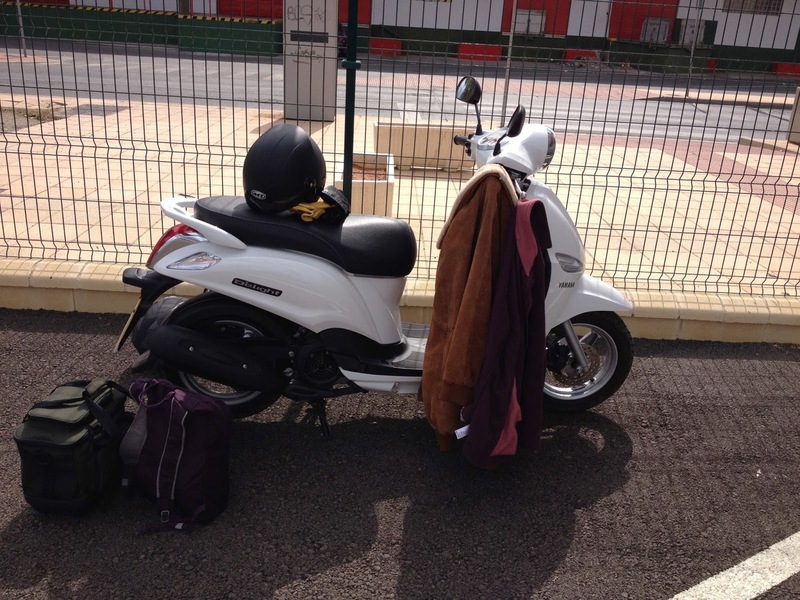 It is amazing how much you can carry home on a 115cc scooter - a tray of beer under the seat, a full bag on the leg shield hook, and a rucksack on Margaret's back. 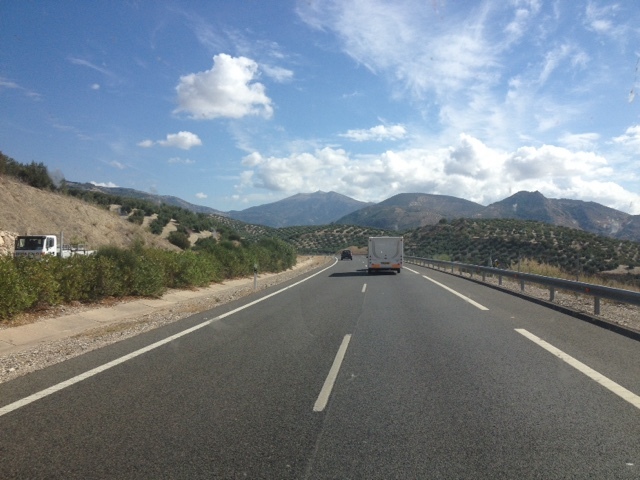 Also much safer to travel with traffic at the speed limit on the busier roads of the city rather than dawdle, causing some annoyance to the impatient Spanish drivers who try and overtake at every opportunity. I took my friend from across the way - an ex-colleague who was also my motorcycle riding partner years ago when we worked for a living, on a ride on the scooter the other day. Now it has had its running in service it is quite capable of up to 60 mph two up. Incredible really for such a small 4 stroke bike. The purchased shopping ready to load up. 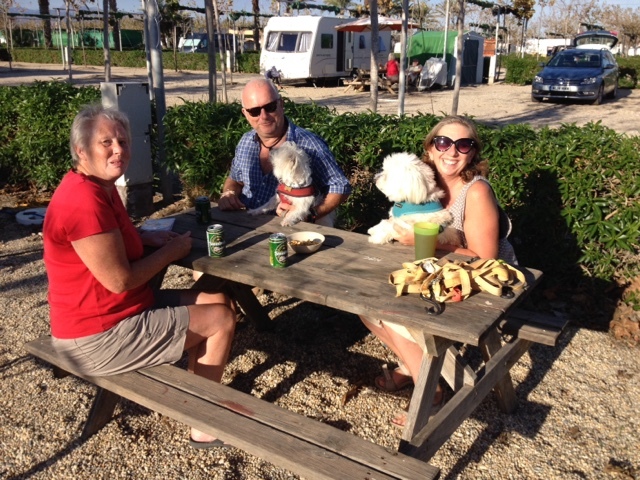 This morning, as most mornings here, we have had a leisurely breakfast outside the van, and then walked to the beach. We complete a circuit which takes us along the promenade at Cabo de Gata, before stopping off at our favourite beach bar for morning cafe con leche. We can also shop for our "bits" here at the local supermarket, which stocks everything we need, but perhaps a little more expensive. If nobody supported them though - they would no longer exist. 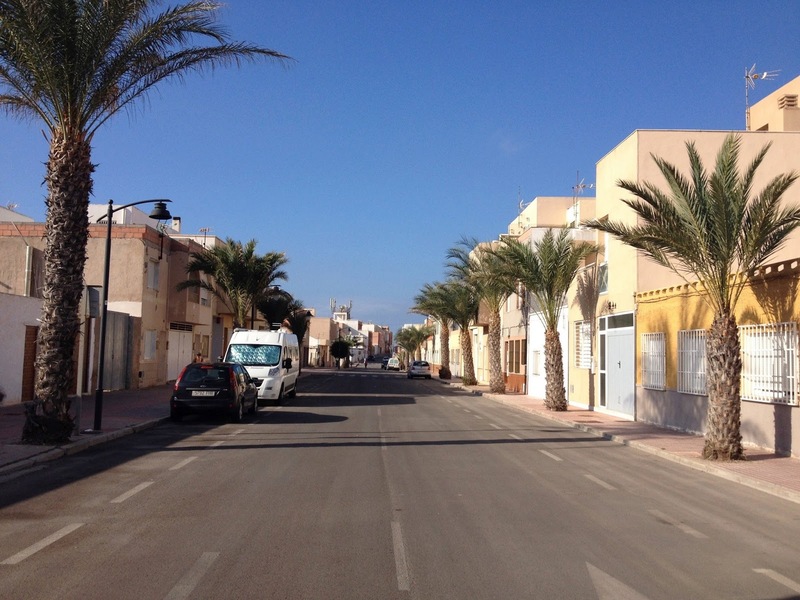 This is morning rush hour in down town Cabo de Gata! This afternoon we are off for drinks with friends. I could get used to this! Cabo de Gata-Nijar Park Natural. The area we are in, around 15 miles East of the City of Almeria, on the Mediterranean coast is the only designated area of desert in Western Europe. With it's year round warm climate and little annual rainfall, the look of the area is bare scrubland from the surrounding mountains to the sea. It is also the world's largest grower and exporter of tomatoes, which means there are acres and acres of greenhouses within the rural setting. This contributes to the area being a bit like Marmite - you either love it or hate it. We love it. If you look beyond first impressions, the area is one of natural beauty, offering much interesting wildlife to look at such as pink flamingos wading in the salinas, wild boar, snakes and scorpions in the desert, and some of Spain's best beaches that are usually deserted, and have not yet been found by the average tourist. There are also many interesting movie locations to view, laid out in a "movie trail". Due to the extreme scenery films such as Patton, Lawrence of Arabia, Raiders of the Lost Ark, and many others were shot on location here. The San Antonio, Texas Mission scenes from the Clint Eastwood movie "A Fist Full Of Dollars" were shot just up the road, and the old building used as the mission is still there to see on a corrugated dirt track about 10km into the mountains. Today, another hot one, we chose the early morning and walked a circular route through the desert towards the sea. The beach here is difficult to access by vehicle and so is little used. It is chosen by naturists as their own ideal location. 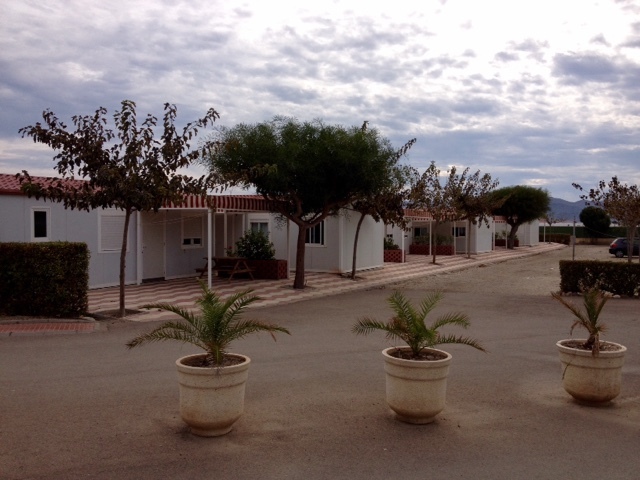 There are other more popular beaches a mile away at Cabo de Gata village, or Retamar 7 miles in the other direction. Other spectacular unspoilt and secluded beaches can be found a few miles up the road near to San Jose at Monsul and Genoveses, again favourites of the naturist community. During the summer months there is a public bus service to these two beaches, as they too are very much off the beaten track. 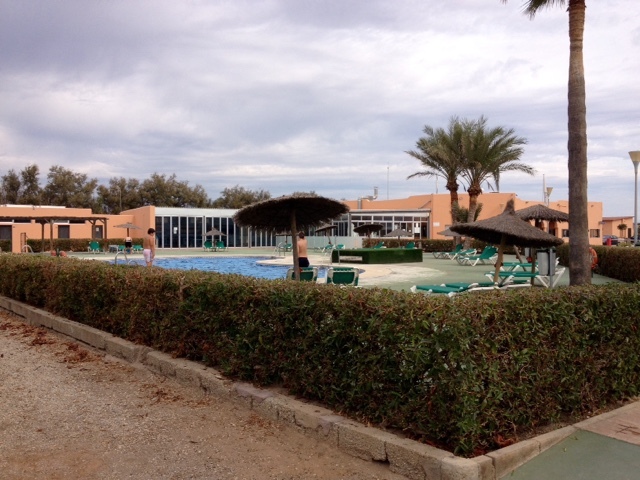 The circular walk we have just completed, through the desert to the beach and back to the site is around two miles. Being totally flat makes it easy, and walking can be done on tracks rather than through scrub, but like we did, probably best done early morning or late afternoon, as once again the temperature here at 11.30am is already around 30 degrees. A Sunday Outing To Retamar. Today was yet another beautiful sunny one. After a leisurely breakfast and getting a few chores out of the way such as the weekly wash, we (I) decided that we might travel further afield on the scooter we brought with us. Margaret does not like riding pillion on the scooter, maybe because I scared the living daylights out of her way back in the 1980's on the back of a Honda VFR 750 during the one and only time she ever agreed to ride with me. That was a trip to Southport which had to be abandoned half way there due to her not liking it. She has never ridden with me since. As for me, I have owned at least one, usually large sports motorcycle, consistently since passing my test at 16 yrs old. My last Yamaha was their top of the sports range 1000cc R1, with a top speed of over 150mph. Riding this little 115cc Yamaha D'Elight is something of a yawn, with a maximum speed of just 55mph, but still pleasurable (for me at least) in the warm sunshine. I had decided to leave the little electric Yamaha EC-03 behind for this trip so we (I) could enjoy trips further afield. Today's adventure was to be just 7 miles each way, to kind of break Mags into enjoying the rides. She still hates it, and will usually pull any excuse not to join me. This time I must say I was more sensible, sticking to well below speed limits, and probably no more than 35mph. If I tried to increase speed towards the 70kmh speed limit on the very quiet road to Retamar, our planned destination, I would receive a strong dig in the back in any case. I must say I enjoyed the afternoon immensely. We parked up in front of the beach and walked up past the shops and bars which were all bustling with Spanish Sunday day outers. On reaching our favourite bar from previous years we parked ourselves at an outside table for a cold beer for Mags and a Coke for me. (I never drink any alcohol while driving/riding). After that we walked down past the row of hotels, where we have stayed in previous years before joining the promenade for the walk back to the scoot for the ride back. All in all a very pleasant day. Perhaps further to San Jose next trip, or possibly not. It is one week today that we spent our first night in Exeter en-route to Spain, and here we are now 1500 miles away from there. 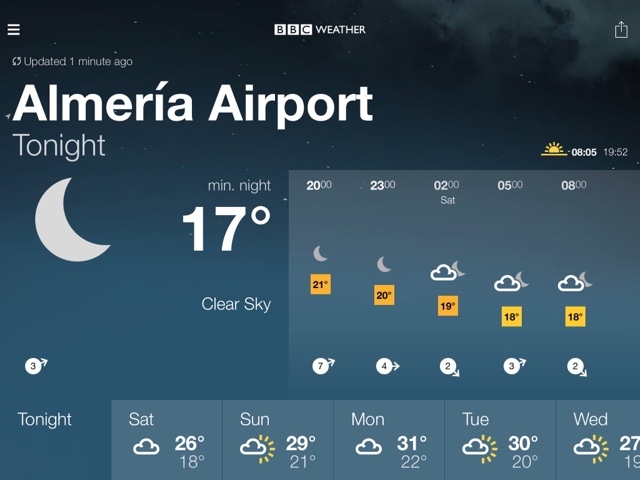 This weekend's weather has been forecast as light cloud with sunny intervals with daytime temperatures reaching 31 degrees, and today has been exactly like that. In fact very pleasant. We have spent the last three autumns in this area and Saturdays seem to have developed their own leisurely routine for us. After breakfast we leave the site for the village centre where there is a small fruit and vegetable market. 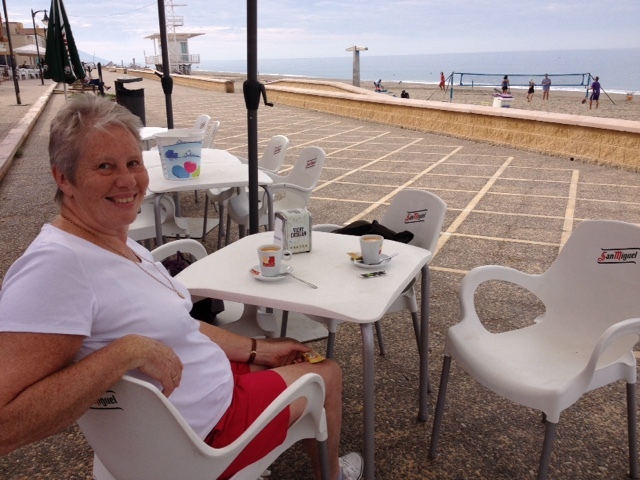 After buying supplies for the week we walk along the sea front promenade and end up in one of the beach bars for morning coffee, before returning to gather ourselves together to visit the local tapas bar back on the main road for lunchtime drinks. Each alcoholic drink is accompanied by a tapas, alternatively if like me you don't drink alcohol because you are driving, the tapas has a small charge attached to it. Today's lunch for me was spicy vacuna, (beef), lomo, (pork) and egg, (huevos). All arrive on small plates accompanied with a slice of French bread and a small portion of fries. We enjoy this in the company of friends, and aquantances, and as the month goes on the numbers increase until we take over most of the conservatory area of the restaurant. This place is also good for a full lunch meal, or raciones as it appears on the menu. To finish, here are a couple of images from around the site today. Months of meticulous planning has gone into this trip. We calculated weights at weigh bridges, obtaining certificates to prove maximum gross weight fully loaded, including individual axle weights. We had the vehicle serviced and gave the (trusted) garage free rein to replace anything that they thought might fail in the near future. The only issue that came out of that was the vehicle battery, which tested OK but occasionally failed to start the vehicle on cold mornings. That was replaced. Everything relating to the living space was also checked and double checked. Within days of our arrival here in Spain, the leisure batteries started to lose their residual voltage too quickly, and were gassing excessively while under mains charge. Today I bit the bullet and replaced them. This is not a difficult task, as they are located in open trays within the rear "garage", and are fitted with quick release terminal clips. Being wired in parallel it was also possible to replace them one at a time without disturbing the 12V supply line to the living quarters, such as the fridge controller, water heater, pump and lights. 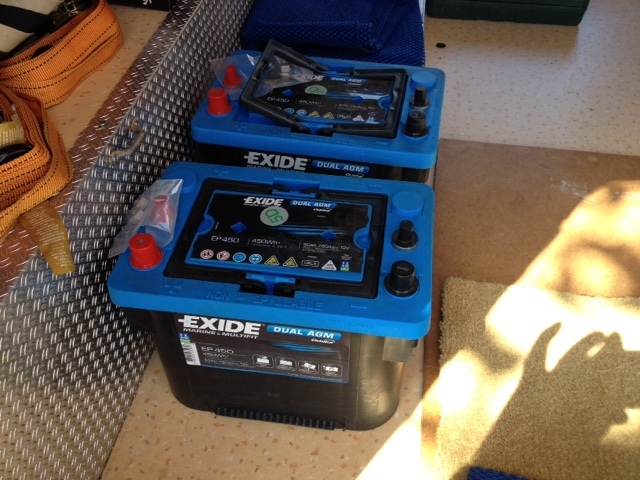 I have decided to replace the old wet acid leisure batteries with Exide dual AGM's, sealed glass mat technology that means they are able to be mounted safely even on their side, with no need to have external gas venting - everything is contained within the battery. They are much safer in this type of use than wet batteries, but are also much more expensive to buy. They also have other advantages in that they are able to withstand longer dormant periods when the camper is not in use. My choice here in Spain was a little limited. 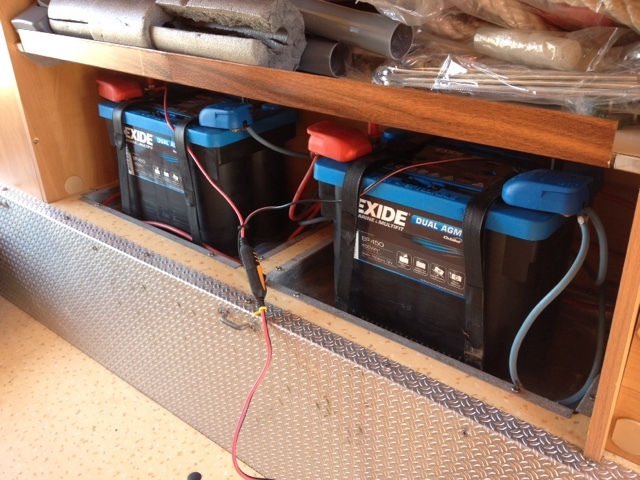 But, today we bought and installed a pair of Exide EP 450 dual AGM marine batteries. These are capable of being used for both engine cranking as well as the slower discharge over a period of time that happens when used to provide power to electrical equipment. This pair, linked in parallel are capable of providing 900 watt hours of power at 12V which I am confident should be ample for our intended use. The job of replacing them is now complete, although I now have to find a way of safely disposing of the old batteries yet. 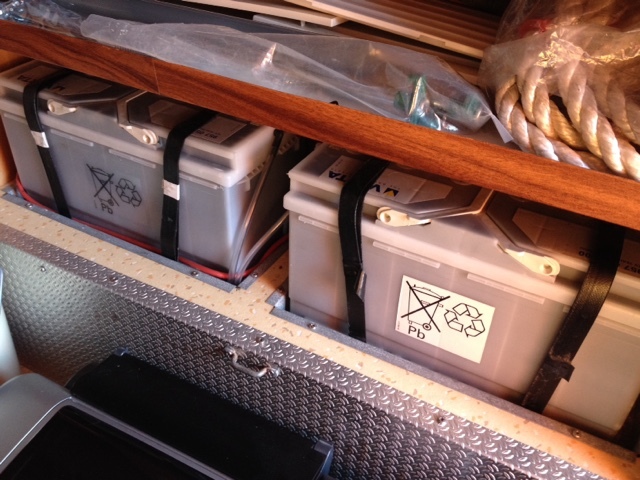 I also took the opportunity of permanently wiring the C-Tek smart charger pigtails to the new battery bank utilising the second set of terminals provided which are threaded posts. Very convenient. 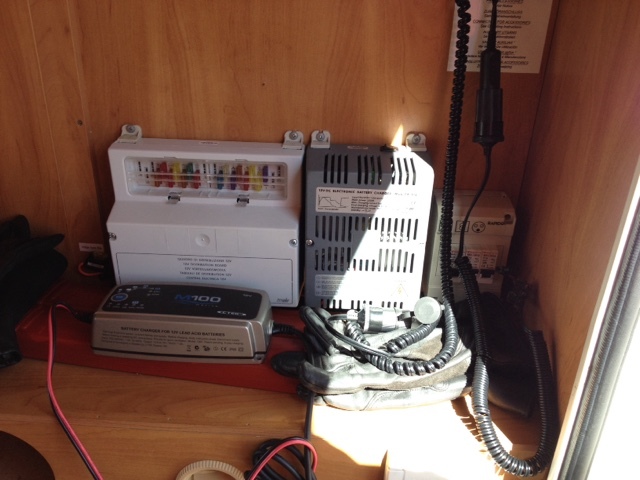 The C-Tek is now connected on it's AGM setting for their initial charge before the solar panels again take over daytime charging, leaving the on board mains charger aside while we have the sun. It is now time for afternoon drinks outside the van in the 27 degrees sun. Happy days!